Parents of children with autism face many challenges on a daily basis, from communication difficulties to meltdowns and many more. Although each child with autism has his or her own unique challenges, many families of children with autism experience concerns for their child’s safety. Consider talking to your child’s autism therapist about home safety issues. Toxic products are a serious safety concern for all children , however, they can be even more of a problem for children with autism. Children with autism can frequently demonstrate mouthing or eating items that are not food. 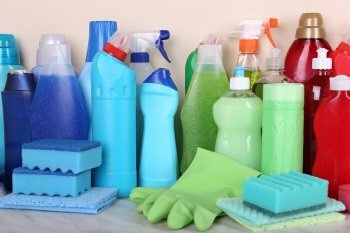 To prevent your child from accidentally ingesting a toxic product, keep all cleaning products out of reach. The same applies to other common household products such as antifreeze, mouthwash, medications, and mouse poison. You may wish to invest in a lockable cabinet, in which you can place kitchen knives, scissors, and any other sharp objects that your child might try to play with. Additionally, walk around your home and consider whether there are any heavy objects that might fall on your child if he or she were to try to climb on furniture. For example, top-heavy TVs are a common threat to a child’s safety, since they can easily topple over and fall on a child. You can mount your TV on a wall and use furniture brackets or safety straps to secure top-heavy furniture to the wall. Children with autism often crawl into small spaces, where they may become trapped. If you have a chest-style freezer, it’s advisable to install a lock on it. Remember to hide the key in a safe place. For almost 20 years, The Behavior Exchange has helped families in the Dallas and Plano areas overcome challenges associated with autism. Our autism specialists use Applied Behavior Analysis to help children with autism improve their communication skills, reduce problem behaviors, and improve their social interactions. If your child is having difficulty across one or more developmental areas, call us today at (214) 556-3947 or visit our website . Autism therapists often recommend that parents keep their children on a consistent routine. A predictable schedule can ease anxiety in children with autism and help them feel more secure. However, sometimes it’s necessary to change a child’s routine, such as when he or she starts school or when the family takes a vacation. Preparing your child for the changes in his or her schedule can help prevent difficulties such as meltdowns. Additionally, remember to discuss your child’s needs with anyone else who may be affected by the change, such as your child’s new teacher or babysitter. Start by discussing how your child’s schedule will change. Use visual cues to reinforce the information and improve comprehension for your child. For example, if your family is going to fly on an airplane to visit Grandma, you can show your child a picture of an airport, airplane, Grandma’s house, and Grandma. Additionally, mark the journey on your child’s calendar. Discuss how many weeks or days it will be until your family will travel. Every few days, you can point to the calendar and remind your child of what will happen. Reading books about a particular transition can help children with autism. Your local library may have many illustrated books available on topics such as starting school, going to the dentist, going to the hospital, and flying on airplanes. Social stories can be very helpful in teaching children with autism what they can expect from a particular situation. You can create your own social story by drawing or printing out pictures that depict what will happen. Add simple sentences that tell your child what happens in each picture or instructs your child on the steps he or she needs to follow. For example, if your child is starting school, one picture might depict putting away his or her backpack in a cubby. When you enroll your child in behavior classes at The Behavior Exchange , our autism therapists will thoroughly assess his or her unique needs. We provide intensive autism therapy in group and one-on-one sessions to help children advance. If you live in the Dallas or Plano areas and you’re interested in learning more about autism therapy options, call us at (214) 556-3947.